With Christmas approaching I will be attending a few local art fairs over the next few weeks. Ideal for festive season shoppers looking for a unique gift. 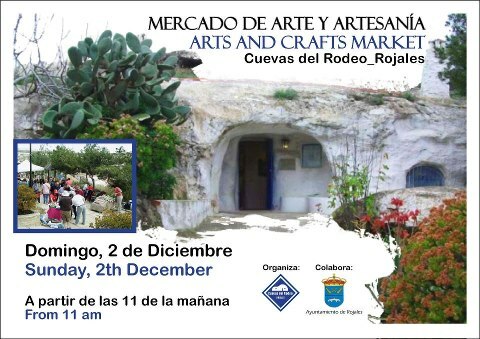 This coming Sunday the 2nd of December from 11 am till about 2 pm is the monthly event at Cuevas del Rodeo. They are a collection of quaint little caves that have been restored by the town hall of Rojales and are occupied by artists and sculptors of all kinds. It makes a very interesting day out and offers a great chance to meet local artists, see how we work and pick up some original hand made arts and crafts. The atmosphere is very friendly and relaxed and sometimes music, entertainment and paella’s are provided for your enjoyment, so make sure not to miss it! Anyway I encourage you to feel free and add your comments, thoughts, questions or any feedback you have as it will only help to improve this experience for everyone. Firstly a big welcome to my new web site, blog, gallery and soon to be shop for prints and more. To start with a big bang I have set up an auction for my airbrushed painting of a 1957 Chevrolet Bel Air, bidding closes at the end of November so GOOD LUCK!